As we’re UK based, let’s throw a little bit of bias into the mix here. The Water Leaper is from Welsh Folklore, a huge frog that is said to eat lures used by fishermen, as well as the fish in the waters and even fishermen themselves. If a fisherman goes out and doesn’t come back, there’s a chance that Llamhigyn Y Dwr (The Water Leaper) is the reason behind it. A dangerous frog, to warn people to be safe out there. … Oh, the Water Leaper is part of Tabletop RPGs as well. I felt a little conflicted about putting Pepe into this list, but considering it was such a big meme, it felt like it needed to be put in. I won’t go into the political aspect of Pepe, but rather talk about what it is. 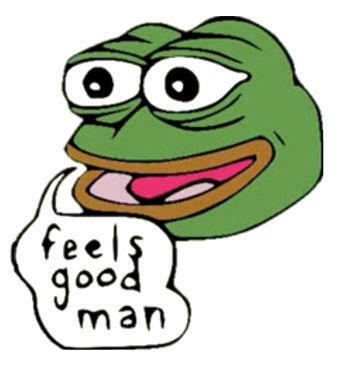 So, it’s a rather happy looking cartoon frog, who was first put out there with the catchphrase “feels good man”. Pepe was put up around the place, used as a way to say someone likes a situation. There’s not a lot more to say about Pepe, but it’s an iconic meme image now. It didn’t take long for it to spread either, as Pepe was first introduced to the world in a comic called Boy’s Club by artist Matt Furie. Originally posted on websites such as 4Chan, Myspace, Gaia Online and even Tumblr, Pepe became one of the most familiar faces of those platforms. There are lots of variants of Pepe, but this one is the most remembered. Does the name “Sanrio” mean anything to you? No? Well if I said Hello Kitty, I bet that would mean a lot more to you. Indeed, Hello Kitty is part of Sanrio, which is a company dedicated to showing off all of the cute and adorable things in the world. The style is always praised for being one of the cutest franchises going, however Hello Kitty isn’t the only character from Sanrio. Introduced in the late 80’s, Keroppi is an adorable frog. Fun fact, Kero is the onomatopoeic word used by the Japanese for a frogs noise, or ‘ribbit’ as we say here. 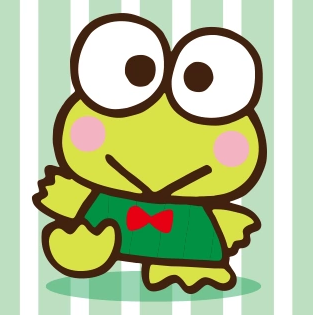 Keroppi is therefore just an adorable way to refer to this frog, or kaeru as the Japanese say. Keroppi is recognisable for his big eyes and v-shaped mouth. He lives in the House on Donut Pond, with his mum, dad, brother, sister and has a girlfriend – most of whom has a name starting in ‘Kero’. This literally fits the bill to the list, considering how we opened this. The Prince Frogs, which are actually called ___ are classics in Crash Bandicoot. If you’ve ever played the medieval levels of the 3D Action/Platformer, then you’ll likely remember a few of the weird recurring characters. The knight with the sword stuck in the floor, the goats with coats… And the frogs. The damn frogs. They’re not tough to beat, but if you manage to get caught out by one, then they will leap up, pin you down and smooch you. This will reveal that they’re a prince! That’s apparently enough to make Crash lose a life, apparently. Anyway, these are memorable enemies, as they come back over a few different levels throughout the games. These frogs can literally give you the kiss of death. A classic in cartoon, Michigan J. Frog is a singing and dancing frog with a top hat and cane. I have no idea where they came up with this idea, but there we go. This had to score relatively highly on the list due to how famous Looney Tunes was, as well as how well known Michigan himself is – Although I couldn’t score him any higher than this, as I bet most of you didn’t even know his name! Michigan J. Frog is most well known for singing and dancing to a tune, “Hello my baby”. With a classical tone about him, Michigan was well represented in Looney Tunes, as he even became the mascot for Warner Brothers. Indeed, it was Michigan that gave the final bow, following Warner Brother’s closure. All of this came from a one-shot cartoon, that was never meant to be anything more than a single skit. Look left, then look right folk, the classic video game Frogger had to make this list. 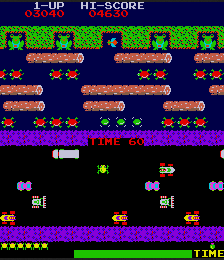 Video games have always had a strange look at the world and Frogger is no different. Featuring the titular frog, you had to guide Frogger across a busy road, then across a busy lake, over to a lilypad where Frogger would sit. Once you’ve done that, the next frog would spawn in and you’d have to do it again, avoiding the same lilypad you put the last frog on. Frogger has had a lot of imitations, clones and upgrades over time. A game that takes the Frogger spirit further is Crossy Road, which is an excellent extension of the idea. There’s nothing particularly special about Frogger on first sight; it’s just a game where you help a frog cross the road. The more you play it though, the more you understand that Frogger is truly an excellent arcade classic. Fingers crossed you don’t get your frog squished by the passing cars! Team17, the company most famous for making the Worms series, also made the superhero Superfrog. This was one of their earliest ventures in making games, where a young Timlah would be enamoured with a frog with the bright red cape. Superfrog leaps mightily into this list, as well as occasionally throwing his sidekick, Splat, into the action. This is a fun platforming title. The story is pretty standard affair, pretty much a play on the story I mentioned at the start of the article (the prince that’s a frog). Thanks to the witch that cursed Superfrog, he gained superpowers as well as having been turned into a frog. He now has to go and rescue the princess from the evil witch, as well as getting himself turned back into the prince that he truly is. You couldn’t get more cliche than this kids title, but that’s part of its charm. 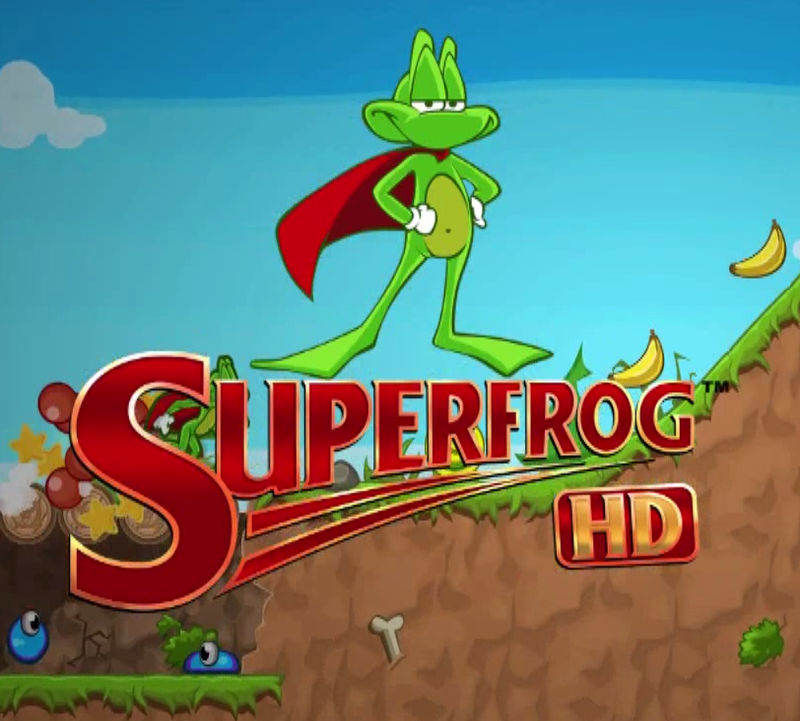 There’s a HD Remake of Superfrog which I reviewed a while back. This brave knight from the middle ages, known pretty much throughout just as Frog, is arguably the coolest frog in all of video games. If you thought Frogger was cool, or even the heroic Superfrog, then this guy tops that chart. 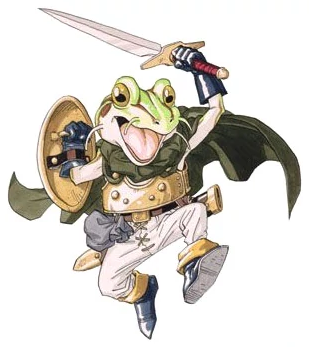 Frog was originally a human by the name of Glenn, who saw the death of his friend, Cyrus and then was was turned into a frog by one of the games antagonists (who later becomes an ally), Magus. Once the Masamune is unlocked, Frog is able to call upon the power of water to assist him in combat. As well as this, he’s an exceptionally skilled swordsman, able to handle multiple foes with ease. Also, once he’s trained enough, he’s able to summon a giant frog to squash his enemies. Frog may be a strange idea for a character, but he’s genuinely an excellently well presented case. You also can’t hate a character that’s supposed to be comedic, but still comes out victorious. The most recent entry on this list, Tsuyu Asui is one of My Hero Academia’s most well rounded characters. She is a human, so it’s odd that I’d put her in a list of Top 10 frogs, but she has all of the abilities of a frog. With her hero name ‘Froppy’, she can do just about everything a frog can do, which sometimes turns out to be disgusting, but there we go. If your superhero power is to be like a human frog, then you’ve got to commit. Froppy is one of the fan favourite characters; she’s often portrayed in a squatted position, with her hands in front of her legs. She has a long tongue which can latch onto people and pull them away. I mentioned a disgusting ability, which basically allows her to swallow something and regurgitate it for later use. Couple this with her leaping ability, there’s nothing she can’t do. Who knew frogs could be so heroic? Jim Henson was a visionary when it came to puppetry. He knew how to make fun, wild characters who would stand the test of time. When Jim died in 1990, the mantle of The Muppets was taken up by others. It’s 2019 as of the time of writing this and these puppets have stood the test of time, from the 1950’s, right up to present day. The head of all of these puppets is a frog. Kermit, the frog is the leader of The Muppets and was the star creation of Jim Henson. His accolades are nothing short of remarkable, as the green frog has held a speech following being given a doctorate. This pales in comparison to the fact Kermit has his prints on the Hollywood Walk of Fame. 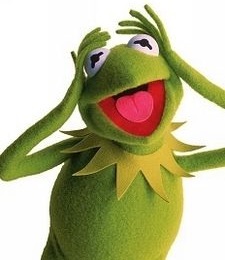 Straight to the point, Kermit is the no-nonsense, straight-talking frog who keeps the Muppets shows together. Have you hopped through our Top 10 list for the week? Great, then it’s time to spawn in two more entries for our Honourable mentions. These next two mentions are pretty much exactly what I described in the opening paragraph, where we mentioned a frog becoming a prince. Well, these next two are inspired by said story… Remember, I said inspired by. King Harold is an amusing twist on the classic tale. The usual tale goes that the princess finds a prince who is at first a frog, but then is returned to being a human, following the kiss of his one true love. King Harold started life as a frog, who really wanted to be kissed by his one true love… So he asked the Fairy Godmother to turn him into a prince. This was enough for him to become the king of Far Far Away. In a twist to the end of the story, when the Fairy Godmother was defeated by Shrek and crew, King Harold returned to life as a frog. Naturally, he didn’t want anyone to see him as a frog, but this came after he stood up to the cruel Fairy Godmother, who wanted to deny Shrek and Fiona the same love King Harold received. This shows you that sometimes, all you need to do is stand up to bullying to be truly accepted for who you truly are. 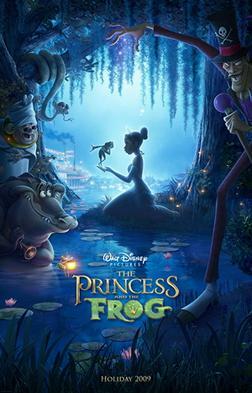 Another twist on the classic story, The Princess and the Frog was a 2009 animated Disney film, praised for going back to traditional animation. As the years have gone on, Disney have done more and more 3D animations, however this was a step back and many people loved it for that. What about the film then? Well the story is of a waitress who meets a Frog. This frog however has been cursed by a Witch Doctor called Doctor Facilier. The Frog was originally the prince Naveem, who was cut off from his families riches. When he got his kiss from Tiana, she was transformed into a frog with him. As a frog, she and Naveem look for a way to break the curse of Doctor Facilier and get back to normality. A fun spin on the classic, which also pokes fun at the classic, by having it read to Tiana at the start of the film. Ribbit, we’ve finished hopping through the list and have reached the lilypad goal at the end. Now that we’ve licked through this like a fly in the air, we’re ready to hop to it again and get ourselves another list for next week. As ever, check out the poll below and help us choose what our Top 10 for next week should be. There were a lot of other frogs I considered putting on this list, so I was pleasantly surprised by the amount of froggy media that was out there. If you can think of any other frogs that should have taken one of the above spots on our lilypads of fame, or if you think I got the order completely wrong, then share your thoughts in the comments below, or over on Facebook and Twitter. This entry was posted on April 13, 2019 by Timlah. It was filed under Anime talk, Entertainment, Film, Gaming posts, Literature, Top 10, Video Games and was tagged with Anime, Boku no Hero Academia, Crash Bandicoot, film, Frog Chrono Trigger, Frogger, Frogs, Hello Kitty, Kermit the Frog, Keroppi, King Harold, looney tunes, Memes, Michigan J. Drog, Pepe, Prince Frogs, Sanrio, Shrek 2, Superfrog, Television, The Muppets, The Princess and the Frog, The Water Leaper, Top 10, Tsuyu Asui, Video Games, Welsh Folklore.